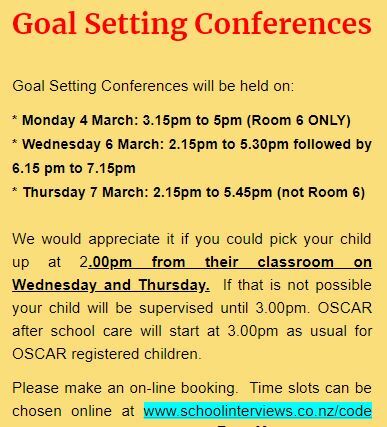 Our Goal Setting Conferences will be held in week 6. BOOKINGS are REQUIRED, please book online. Wednesday 6th March: 2.15 pm to 5.30 pm followed by 6.15 pm to 7.15 pm. Please pick up your child at 2.00 pm from their classroom on Wednesday and Thursday. If this is not possible your child will be supervised until 3.00 pm. OSCAR is running as usual.